Insightful excerpt from Lossani's new book! At times mesmerising, but more often confusing. The translation is very 'Italian' in parts, which diminishes the effect of the rhetorical flourishes - and rather detracts from the overall flow (which could also, in part, be down to cramming too much research into too few words: footnotes are a far better solution for such dense narratives as this one). Rather like the homage to Oscar Aleman which came out a few years ago, the English language version here strikes me as something of a lost opportunity. Is this in print yet? If not, the author/publisher seriously need to get it proofread. You're right - it isn't an English test. However, the translation as it stands is a self-imposed limitation on your potential English readership. If your book isn't intended for an international audience, then sure - it doesn't matter. It's not a pitch to find work, either. It's a pro-bono offer - 'volunteer' being the word. The original Italian, is, I am sure, absolutely magisterial: I'm familiar enough with the language to know what was being strived for here. It would be marvellous if the English version could reach the same heights. Great stuff and the English translation is "charming". It does require your brain to do a "re-translation"
Well done.. but I concur, .. since a vast number of Django and gypsy jazz devotees are English speaking, a more exacting translation would benefit many, including the author. Nice piece, Fabio, with some exciting new discoveries! The fork kills more than the sword! Is it possible to give up Italian cuisine? The quest for a new sonority nearer to anxiety that pervades you is a fundamental element of the be-bob curse. The war on "Am7 and Cmaj7"-style English begins here! I wouldn't change a word of this, it's way too much fun. A German friend once told me of an e-mail correspondence he had with an Englishman who didn't speak, read or write German, but simply used "Google Translate" to read or write every message. "So, could you understand his messages?" I asked him. Hello Fabio! (spero che stai bene!) do you agree with the following or have something to add or correct? Django and Stéphane arrived separately. Grappelli arrived first in Italy and began to play at Ciro's (one of the many restaurants opened in several countries US, UK, etc...) with an unknown group. Django arrived before CHristmas 1948. Then they joined for a two monthes gig at the "Astoria" in Via S. Maria Beltrade in Milan. The Quintet was formed with Django (g), Stéphane Grappelly (v) and guitarists Franco Cerri, Piero Visani (that alterned with guitarist [and violinist] Armando Camera) and with Ubaldo Beduschi on double bass. 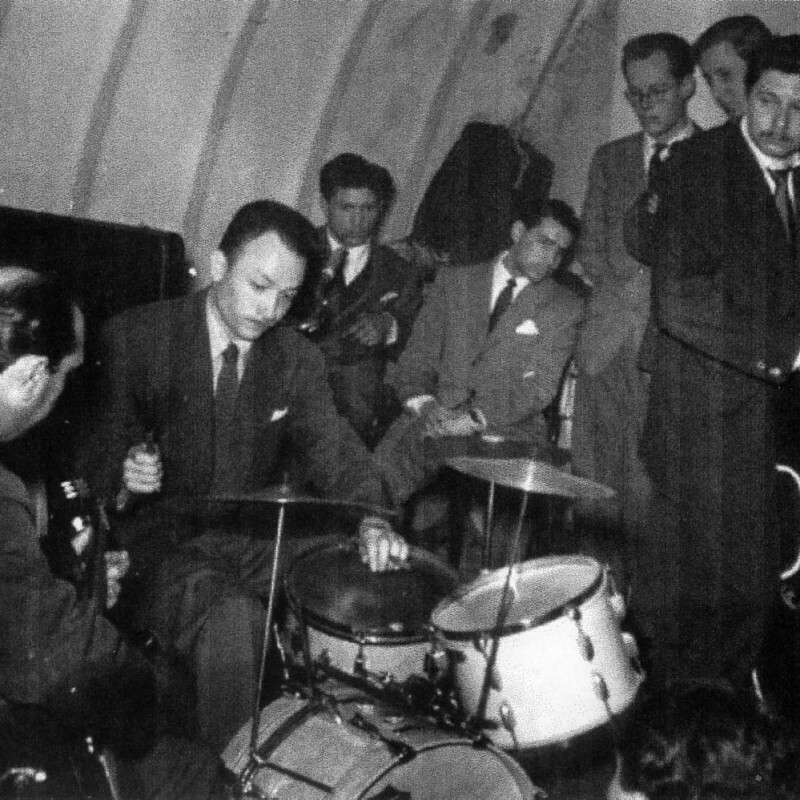 Beduschi is the man holding the double bass on the famous photo owned by Cerri. Adriano Mazzoletti - always very critical with Django fans as many of the italian I personnaly know - is one of the better sources of informations on Django in Italy. He says that there was almost no advertising done on that tour (nobody knew they were there!) only some newpapers indicated their presence at the Astoria (now a a still existing but recently definitively closed very old cinema) by some spots where their names were written in small letters under the very big name of Bruno Quirinetta that leaded one of those show orchestras that were in the fashion in those days - kind of musical clowns). The success was not present and Django decided to leave that gig before the end of the contract. He and Grappelli went to Rome abandonning the musicians in Milan and went to Rome at 500km from that grey city of Milan. They were not followed by the newspapers periodists that all went to Paris for the second Jazz Festival (the modern one with Parker organized by Charles Delaunay in opposition to the first Jazz Festival of 1948 organized by traditionalist Hughes Pannassier in Nice). Django and Stéphane were soon engaged to play at the "Jicky Club", the night club of the restaurant "La Rupe Tarpea" in Via Veneto 13 near Piazza Barberini. In that club there was life, important actors such as Anna Magnani, Totò "Principe Antonio de Curtis", celebrities such as Porfirio Rubirosa and also the famous and very riche Prince Dado Ruspoli. He was so rich that once being asked : ""Haven't you ever worked?" "No," came the riposte, "I've never had time." They all went to hear Django and Stéphane playing there with great pleasure. The Jicky Club [Tel : 460.618 for late booking] was situated under the street and managed musical entertainment while the luxuous restaurant "La Rupe Tarpea" situated upstairs also proposed two shows every night (at 10pm and 1am). The place was really better even if sometimes italian people were criticizing as in Milan the music of our heroes. One night a drunk man asked them to play "Ménilmontant", they accepted immediately and played the tune, but the man wasn't pleased and asked them again to play it. They did it but again "Bacchus" wasn't pleased by the way they did it and he throwed his shoe against them. We have to hear again the version Django and Stéphane recorded the tune a few days after to understand if some shoes mouvements can be heard... Of course neither Django nor Stéphane, professionnaly trained to those kinds of things, had any reaction. There were no other incident during their stay in Rome. During the whole gig in Rome Django didn't stayed in an hotel. A room had been booked for him in the still existing Hotel Alexandra in Via Veneto. He prefered to stay in the roulottes of some gypsies that were holding a merry-go-round in a luna park near Piazzale Claudio. The two musicians were very often invited in pianist Armando Trovajoli's home and played many times with him but no recordings are known as recording equipments were rare in those days. Django and Stéphane also were invited to by Christian Livorness, a RAI collaborator, to record 87 tunes [for me a marvel] in the Rai Production Studios of Via Asiago. Those recordings were sold to La Voix de son Maître and to RCA years later. Can you say us more on that famous Livorness?